We are so fortunate to have Kenny as a lead technician. 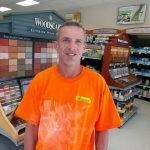 Coming from a background of all areas of painting, he is able to perform custom interior, commercial painting, wallpaper removal, along with drywall repair that is second to none. There are no excuses with Kenny. He gets the job done, on time with Superior Workmanship. When some people tell us why it cant be done, Kenny will tell us how it can be done. He tackles the toughest jobs making your home Look Its Best.